The most important class early on in the game, Engineers build the bases that are placed by the commander. Though technically any class can put a building together by approaching it and pressing the USE key (E by default), engineers are given a tool that greatly accelerates the process. Engineers are limited to using light submachine guns but they carry seismic grenades which deal huge amounts of damage to buildings. The engineer's main asset is a small tool that he keeps clipped to his belt. With this tool an engineer can build and repair vehicles and placed buildings, heal teammates, and even place his own structures (The Turret and Surveillance Gear). To build, repair, or heal, simply walk up to your target and activate (Fire) the tool while aiming at the target. You may also damage enemy structures and vehicles by using your engineering tool on them. Additionally, the repair/heal tool can be given the ability to Revive an fallen comrades, making an engineer an invaluable member of a squad both during and after firefights. To revive a teammate who has not yet respawned, activate the tool while pointing at his body. You must be near the teammate's body for this to work. With his skills the engineer can expand his role as a mechanic or a medic, with his versatility limited only by the number of skill slots the player has unlocked. Revive and Repair Upgrade are the most basic skills of the class. Revive allows you to revive a dead teammate, and Repair Upgrade allows you to repair/destroy buildings/vehicles with doubled efficiency, both are exceptionally useful for most of the rounds. Engineers can also use "Vehicle Cooling" skill to increase the rate at which the engine dissipates heat. This lets a vehicle driven by an engineer maintain continuous fire for a longer period of time than would be otherwise possible. There is an old saying: "Without supplies, neither a general nor a soldier is good for anything." In much the same way, without Engineers, the armies of a nation would be useless. Although technology may have increased the efficiency and effectiveness of an Engineer, their role as the backbone of any military has remained unchanged since the Great Empire. As the technology employed by Engineers has advanced, they have become more of a front-line force in battle. In the days of the Great Empire, Engineers rarely met enemy infantry head-on, but as their tools became more mobile and versatile they have been shifted to the front in greater and greater numbers. In current conflicts, Engineers fulfill every support and defensive role needed by an infantry squad, and can often be just as effective as a Scout, Grenadier, or Rifleman. This effectiveness is best demonstrated by the development of units such as the famed Jedidiah Defenders, a Brenodi Battalion consisting almost exclusively of engineers. This concept was considered ludicrous at the start of the Kolntus-Emin War, when engineers were first being introduced into the front-lines of combat. Nonetheless, the Defenders proved themselves invaluable as reserve forces for the Empire's military, and aptly handled state emergencies and national disasters when more heavily armed units without technical training would be lax. Any doubts about engineer exclusive military battalions were annihilated by the height of the Kolntus-Emin Conflict, when the Brenodi Empire was forced to deploy reserve forces into the front lines of battle. The Defenders were one of the first reserves to encounter Jekotian advances into Brenodi mainland, and they quickly proved their worth. In the first weeks of the mainland offensives, without heavy tank squadron support, without heavy weapons platoons, and without rifleman platoons, the Defenders were able to repel the following infantry advance, blunt the light tank assault, and suppress the insurrection in the Jekotian cities they proceeded to capture. A true jack-of-all-trades and master of none, these battalions demonstrate the necessity of the engineer class in modern combat. An Engineer can either repair or build structures placed by the commander, or build a limited range of equipment of his own. When repairing damaged vehicles, the hull is repaired first before armor. Engineers can also deconstruct enemy buildings, equipment and vehicles. Approach and point your repair tool at the enemy structure or vehicle, you should see a red health bar. Now press the "fire" key just like you would to repair a friendly building and you will start deconstructing the enemy's structure. Note that deconstructing enemy vehicles bypasses the armor and causes damage to the vehicle's hull directly. Engineers can also recycle resources from carcasses of vehicles left by enemy or ally. To deploy your own structures first right click with your engineering tool out to bring up the build menu. From here you can build turrets (machine gun or missile), surveillance equipment (cameras or radars), walls, and ammo crates. An Engineer can only have a finite number of turrets/sensors up at any given time, which is related to your current ranking. See the build menu for details: the numbers below each deployable type signifies the how many of them you placed and the total amount available to you at that time. There are two types of Turrets: Machine Gun (MG) and Missile (ML). Machine Gun turrets will automatically attack any enemy infantry that come within its area of effect, with 100% accuracy. ML turrets will fire at any enemy vehicle or structure within its area of effect. Keep in mind that the turrets are not awfully smart and will not prioritize their targets based on their threat level, they will simply pick the closest target and concentrate on it until it's either dead or not in its direct view. The Missile turret for example will pick a building instead of a tank that's pounding on it if the building is closer. Both kinds of turrets have unlimited ammo and do not require rearming, but have limited range and firing speed. The engineer can upgrade his own turrets, granting them increased lethality by increasing their damage and range. The Turret Upgrade skill lets engineers who have placed and built a turret upgrade that turret, first to level 2, and then to level 3. These turret levels do not correspond to those that the commander can research. This means that an Engineer can upgrade his own turrets even if the Commander has not yet researched the corresponding upgrades. Note, however, that an engineer cannot upgrade a turret that was placed by the Commander or another team mate. To upgrade a turret approach it and right click on it with the engineer tool. Select "upgrade turret" from the menu, and then build your now upgraded turret. Remember that while you're upgrading it, the turret is deactivated and vulnerable. The upgraded turrets are not to be underestimated. Surveillance equipment will detect enemy infantry (Camera) and vehicles (Radar) when they are in their area of effect and display them on the minimap as well as draw an orange diamond around them right on your HUD, which is visible even behind terrain and obstacles. Both of these deployables do not need the line-of-sight to detect the enemy and work through obstacles. To place walls as an engineer, click on the walls icon in the engineer menu. Then click on the ground where you want your wall to start. You should see a "ghost" of the wall appear. Drag your mouse to build more wall segments (You can even walk around to place longer walls) and then click again to complete the wall. The newly created wall will only be 25% high and needs to be completed using the Repair tool. Ammo Boxes can be placed practically on any flat surface and can be used by all friendly infantry units to reload. When dropped near a vehicle, the Ammo Box will auto-reload them. Be aware that Ammo Crates persist for exactly 2 minutes, and there is a 200 second delay(Will be shorter if you have higher ranking) between placing another one, so use them wisely. 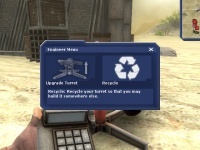 Finally, you can recycle equipment that you have placed by right clicking on them with the tool, and selecting Recycle from the menu that pops up. You can recycle your own turrets, sensors and walls but not ammo boxes. You cannot recycle structures or equipment placed by the Commander or other friendly Engineers. Note: You can recycle turrets and sensors without being next to them by using your build menu- useful if it's way over the other side of the map! A very powerful Revive skill allows the Engineer to bring back a fallen team mate back to life, providing that they have not yet chosen to respawn. Not only does reviving a team mate keep them on the front lines, it also saves your team a respawn ticket. In order to revive a "dead" friendly player, point your repair/healing tool at their corpse and press the primary fire button. Due to the way the server and client communicate, a friendly's body might not be at the same place they died (grenades and missiles often move the ragdolls from where they originally fell.) In these cases you might be unable to easily revive your comrade by pointing at their corpse. Try moving around the corpse while holding down the "fire" button to try and get in range. The Revive skill has a large area of effect which should alleviate some of that trouble. Also keep in mind that you will not be able to revive players who have committed suicide (typed "kill" in console). Reviving uses 50 units of the repair tool's ammo, so make sure you have at least that much before attempting to revive. Note: In addition to the regular rank points for killing enemies and destroying their buildings, the Engineer gains one rank point for every 100 armor points repaired, for every 200 health points healed, and for every fallen teammate he revives. Note: A dead player's corpse is removed as soon as they respawn. If there is no revive icon above the corpse of your teammate, that means you cannot revive them. This role falls to engineers who remain behind the battle lines to help the commander erect structures, repair retreating vehicles and heal infantry but generally don't attack very often. These are the guys who go out and construct refineries after the battle has focussed on other parts of the map. Repair upgrade: This greatly speeds up build times and you repair buildings and vehicles faster. Turret upgrade: Building a turret near an outpost or a flag will help your team keep the position secure more easily. Healing upgrade: Helping injured teammates fight better. Revive: Odds are you wont see a lot of fallen teammates, but the odd assault might see need of your services. This role falls to engineers who team up with riflemen, grenadiers and tank units to engage the enemy. They keep teammates stocked with ammunition and their seismic grenades can take out structures in a jiffy. Usually in the thick of battle, they are true combat engineers. Revive: Early in the game when assaulting enemy positions, bringing back fallen friendlies is a priority to keep the pressure on the enemy. Turret upgrade: Upgrading your turret can turn it from a minor annoyance into a deadly weapon. With covering support from vehicles, level 3 turrets can be set up on the front lines to devastating effect. Vehicle cooling: By this time you're probably engaging enemy positions in tanks. Having some extra cooling is always good. In case of flag map, pick healing. Repair upgrade: Keep your tank and others running longer. After the 4th promotion the total number of turrets and sensors an Engineer can place is increased by one. If your base has no armory yet, try switching to the Engineer class and dropping an ammo crate for yourself and switching classes again instead of asking teammates or the commander for munitions. Most of the Engineer's equipment can be used as a makeshift step-ladder in case you need to reach the tops of those high crates. Reviving a friendly will save the team a ticket. This is critical in most games, since when the ticket counter drops to 0, respawning at a barracks or at an APC is impossible. Walls can be used as offensive tools. If you're fast and skilled, you can drop a wall section in front of an advancing enemy tank, stopping it dead in its tracks. Walls can also be used as a strong cover for your teammate while pushing forward, for this scenario, it's best to keep them unbuilt. Know when to place your ammo crate. If you don't have any team support and need to destroy an enemy building right away, that ammo crate contains an infinite supply of seismic grenades that will turn you into a solo demolition squad! But if you dropped it earlier, you might have to wait a long time, and you'll have to deconstruct the building slowly. Fortify the commander's defenses. If there's an APC being used as a temporary frontline base, drop some walls to protect it. If there's a refinery that's fairly exposed, drop some walls between it and the enemy. Walls will buy you some time when a grenadier starts attacking that area. This technique is good for just about every small structure. But don't wall off turrets or the command vehicle-- the former needs visual access, and the latter needs mobility. Learn to use camera/radar well, the former is capable of detecting nearby enemy infantry, the latter is for detecting nearby enemy vehicles. Under feasible circumstances, try to revive your teammate first instead of attacking enemy. This page was last modified on 27 February 2019, at 13:30.